Peter Allen's stirring song 'I Still Call Australia Home' has been Qantas Airways' unofficial anthem for years. I wonder how many Australians will continue to fly home on Qantas when considering the arbitrary new dress code and rules introduced in April this year. Some weeks ago I was barred from entering the Qantas Club due to my attire. This entertained me no end. When I gleefully posted my outrage on Facebook I got my fair share of sympathy, though the post didn't quite go viral. 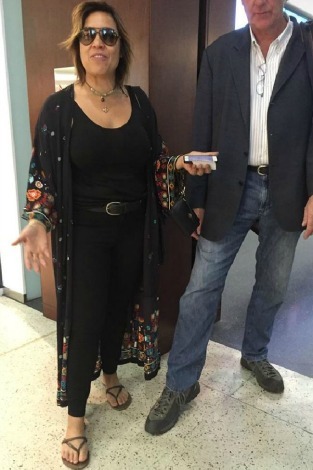 It was vindicated this week, however, when singer Kate Ceberano met a similar fate at the Qantas lounge at Melbourne Airport, en route to a gig in Brisbane following her performance of 'Advance Australia Fair' at the AFL Grand Final. Perhaps the fact that she mixed up a couple of words during the national anthem bothered the patriotic Qantas, and called into question her Aussie street cred. Whatever the reason, the singer, who has been a member of the club since 1990, was removed for wearing 'inappropriate footwear'. The offending footwear? A pair of designer thongs, matched with a trendy kimono, slick black pantsuit, jewellery and a funky belt. Poor Kate. She, and many others no doubt since 1 April, have had to suffer considerable discomfort and embarrassment due to this new dress code. Now to be perfectly honest, I was never all that fussed about being a member of the Qantas Club in the first place, and only joined when I realised that with the amount of work-related flying I did, my joining would actually save my organisation money. Also, to be fair, kicking a celebrity out of the Qantas lounge is not exactly a hate crime. With a dress code that bans thongs, gym gear, and high-vis work wear, it has become an elitist club that only welcomes the very privileged. My membership is about to expire, and while smuggling some 'baby bottles of booze' out of the lounge in Broome saved me a few bucks on the flight home, my experience of exclusion got me thinking about the more important things in life, like how we judge who is worthy. The late Fr Ted Kennedy, the much-loved priest of Redfern, wrote a book in 2000 with that title: Who Is Worthy? It's unlikely Fr Ted ever joined the Qantas club, as he felt his place was with the people — in particular, with the Indigenous and the outcasts, many of whom resided in his neighbourhood. I must admit to now asking myself cheekily if I am worthy of entry to the Qantas Club. I also wonder what Jesus might have said in these instances. My suspicion is 'humble yourself and you will be exalted', or perhaps 'The first will be last, the last will be first'. Then again, with his sandals, beard and Middle Eastern appearance he might not have even made it past airport security. Qantas perhaps sees itself as a tolerant and inclusive airline, demonstrative of our great liberal democracy. Perhaps its intention is to model a dignity that allows it to impose such arbitrary judgment on members' appearances. Yet by refusing even high-profile Qantas members entry it shows itself to be more concerned with keeping out the gym gear and high-vis vest-wearing riffraff than customer service. So who is worthy? If even celebs get kicked out after performing at national events, the organisation risks becoming one very elitist, sexist boys club, where only a privileged few measure up. Beth Doherty is a staff writer and editor at Jesuit Communications. Kate Ceberano wasn't bothered by her exclusion to the Qantas Club, so neither should you be, Beth. Qantas made its new dress code publicly known. It has a right to let in who it wants. Your rant is all rather pointless when the very people using the Club are finally having their voices heard by Qantas. Do I want to have my breakfast next to a thong wearing tattooed bogan whilst in a business lounge? No I do not. Thanks Qantas about time . My bush with Qantas elitism. The ‘new’ dress code before boarding business class http://shared1.ad-lister.co.uk/GetImage.aspx?cid=31eafc4a-4fbe-499a-91f8-132ab0bdba49&id=97c6d3d4-3583-4d3f-89c4-8e223fd45f7f&num=1 One size fits all. I like it. If you rail against Qantas' dress code, why not also take aim at every RSL and other licensed club? It's about time standards were observed: it's all about respect and consideration for others rather than being mean spirited. Qantas is fair and a very generous Australian company - it's time for its petty critics to smell the coffee!! I was interested to know if mine workers would be allowed into the Qantas Clubs, so checked the guidelines online and discovered that work uniforms, including hi-vis, are permitted. So Gareth, you still may be faced with eating your breakfast in the company of bogans! Don't fly Qantas. They treat their workers even worse! Come on, what's elitist about dress standards? Schools have them, workplaces have them. There is even a dress code at St Peters in Rome. Good on Qantas for maintaining standards. If you don't like the dress code, just don't join Club. Oh dear Beth, were you wearing a bikini? Loved what Kate was wearing, wish I could too, but at 80 no hope. Dear Gareth, have they banned tattoos as well as thongs? Why Australians shout so loudly about dress codes, particularly when they are made public is beyond me. Get over it guys, and just front up in the right gear! We are a well to do enough country. People are paying for having standards upheld. You don't have to go into the Qantas Club lounge if the standards are too high. Qantas has been amazing to my husband and I [BTW not Qantas Club members], and treated us with so much compassion and consideration during family crises a few years back. I salute them. We do need to accept there are places with high standards, and start to behave like so many civilised parts of the world. No one is compelled to go into the"elitist" lounge...you have a choice! "Smuggling... booze" - we call that theft. I'm with you Comrade. From hereon, as a measure of solidarity, I too will stick it to the Qantas Club and their bourgeois clientele with their closed-in footwear by defiantly wearing my flip-flops to the airport. Hmmm... Hang on a minute... I know this may sound counter-revolutionary but perhaps I could pop on a decent pair of shoes and just get on with life? I am a member of the Qantas Club and initially joined when traveling alone overseas. The annual fee is expensive and those who can afford to pay it can probably afford appropriate shoes. I also would not recommend flying in open shoes for safety reasons. Doesn't the fact that Qantas applies the rules equally to everyone including celebrities demonstrate that it is not elitist? Similarly, as the rules are not gender-specific, how can this create a boys' club? At age 69 and a Qantas club member since the 1980s, I was appalled at the arrogance of a Qantas staff member who, after having to actually ask me whether I was wearing thongs, tried to ban me from the club. My attractive wedge shoes, with large foot-covering horizontal band, that was supported by an invisible piece of vertical leather between the toes, were the cause of this person causing my embarrassment. A Qantas colleague stepped in after 5 minutes of rather heated discussion and advised that the shoes were acceptable. Next time I will have a pair of my husband's old loafers as a backup! Still, my main point is the way the Qantas employee spoke to me, like a child, a second class citizen. The policy is ill thought out. It appears to be targeting men in thongs but is affecting women in light fashionable summer shoes. I am a gold Qantas frequent flyer and I object strongly to the policy. Does Qantas equate itself to a RSL club? It should look at the overall standard of dress not the straps on shoes. If I ever use QANTAS again which is doubtful, I'll make sure I wear gum boots.